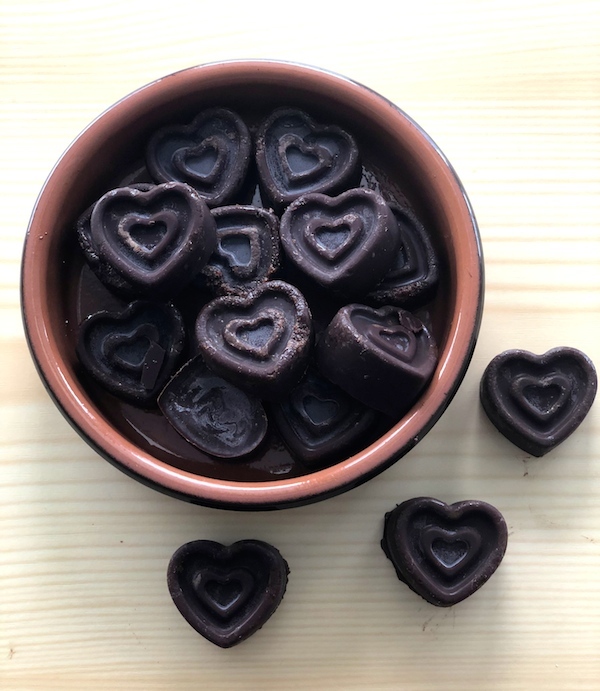 If you like dark chocolate and raspberries, then this 4 Ingredient Dark Chocolate Raspberry Hearts recipe is just what you need. Delicious homemade chocolates that are easy to make and use only healthy ingredients. Dairy free, vegan recipe. Enjoy the benefits of eating real chocolate! I love dark chocolate. The first time I made my own chocolate, I researched all the health benefits of eating cacao and was really impressed. Unfortunately, most commercial chocolates are not made with cacao. For more information please see my Are You Eating Real Chocolate? post. You will discover the amazing benefits of eating real chocolate and it will inspire to make your own using high quality ingredients. 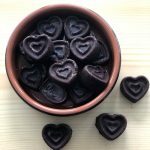 This 4 Ingredient Dark Chocolate Raspberry Hearts recipe is very easy to make, uses only 4 healthy ingredients, and it’s so good for you. Yes, these chocolates are super healthy, full of antioxidants, nutrition, and no processed or refined ingredients. If you are thinking of making these chocolates for your family and friends, this recipe is the perfect way to say “I love you”. Chocolate that is good for your health. It takes only 5 minutes to prepare and OMG! you have delicious, mouth watering, dark chocolate hearts. Loved the combination with the raspberries. I like my chocolate a bit bitter but if you have a sweeter taste, just add an extra tablespoon of maple syrup. For this recipe I used Cacao Powder , Maple Syrup (or honey for non vegans), Coconut Oil , and fresh raspberries. A delicious and easy vegan recipe using the highest quality ingredients. I also used my Double Heart Chocolate Mold but any silicone molds will work just fine. You don’t need to oil them, the chocolates pop right out. For more cacao recipes, please see Cacao Cupcakes made with almond flour and a delicious cream cheese frosting, or 3 Ingredient Chocolate recipes. My recipes are very easy to make. 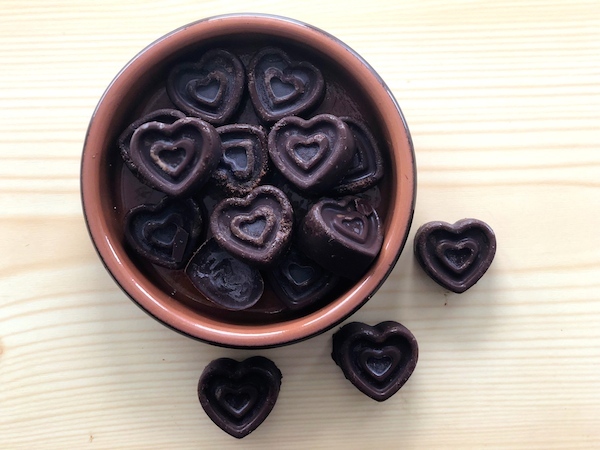 Delicious and healthy dark chocolate raspberry hearts treat for kids and adults. Dairy free, no bake vegan recipe. Made without refined sugar. In a medium size bowl mix the cacao powder with the melted coconut oil. Add the maple syrup and the fresh raspberries and mix really well. I used a hand blender but you can whisk by hand too. Using a ziplock bag (cut a tip at the end),or small spoon, fill your molds with the mixture. Chocolates will come right out of the molds. Enjoy! If you are interested in reading more about my blog, please take a look at my latest articles. I am a mom blogger who loves to share creative and healthy family ideas. If you try this recipe, I will love to know if you also loved it. You can leave a message or review below. Or find me on Instagram @creativehealthyfamily. easy to cook chacolates… that too….least ingradients and healthy… thanks….